Marko shows us how it’s done in the dark. Montana is a special place, and there is a reason that the autumn is one of my favorite seasons. I wasn’t expecting it, but taking the opportunities at hand landed me a triple header of my favorite adventure sports- all in the same week. I was in Bozeman all week for work. I had hoped to find a ride on craigslist so I could stay the weekend while my co-worker Mark headed home on Friday afternoon. The rides didn’t work out, but I wasn’t going to waste the opportunity. Wednesday night we picked up some awesome fried chicken and headed up to Genesis I for a night-time session getting back into ice climbing. With a full set of borrowed gear from Ari and Marko (thanks! ), Mark came along to swing tools for his very first time. Getting my first leads, and sharing the experience with fine friends made for a perfect night despite some cold temps (6F when we left the car). Getting ready for my first sticks of the season. Beginner stoke. Props to Mark for braving the cold to come check it out. After 20+ meetings in Bozeman, I was ready to head home Friday night, but my new friend Molly was eager to ski on Saturday. I was pretty eager too, and Anna was from Bozeman and feeling behind on her season already. We headed for St. Mary’s at 830am, got the car stuck around 10, and topped out around 2pm. 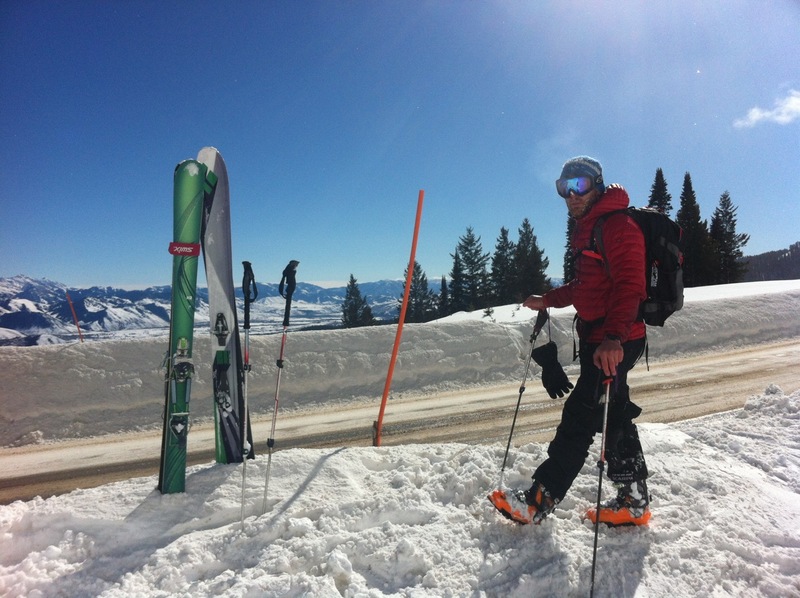 The snow was fun, but there still wasn’t very much of it so I was glad to be on my older telemark skis (the new dynafit setup is waiting for a few more storm cycles). Molly and Izzie making short work of the skinning. 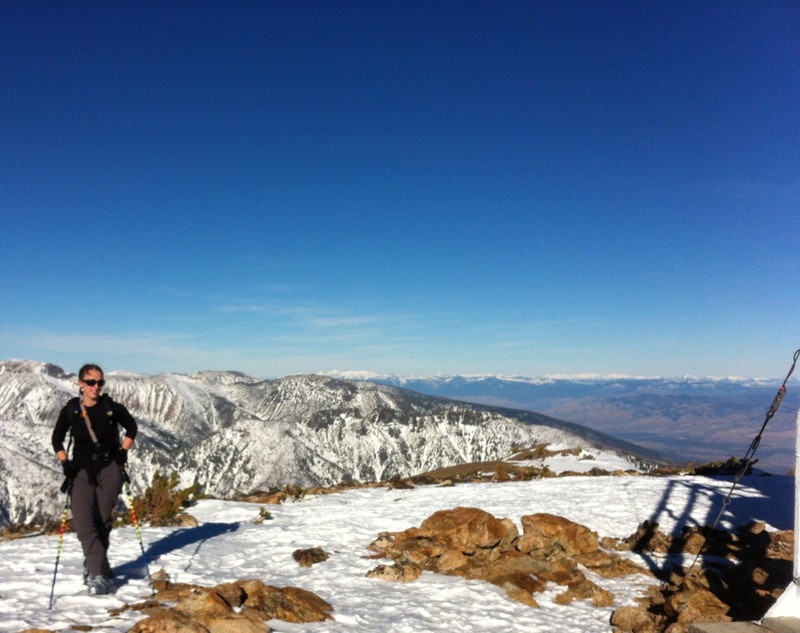 Anna on top of her first Bitterroot winter summit. With another day of splitter weather in the forecast, there was no reason not to try for all three sports. Even with the cold temps, there were about a dozen people headed to Mill Creek and I was happy to join in the fun. 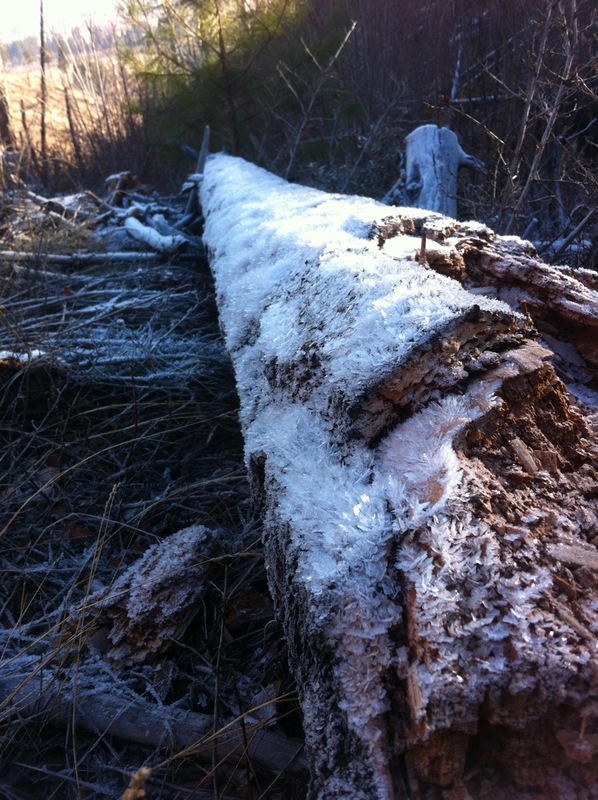 Just “a little” hoarfrost on the hike in. Chilly mornings in the Bitterroot. Molly and I ended up teaming up again, and I was psyched to nail my hardest on-sight yet: “No Drama Obama” (5.11b, 30m). 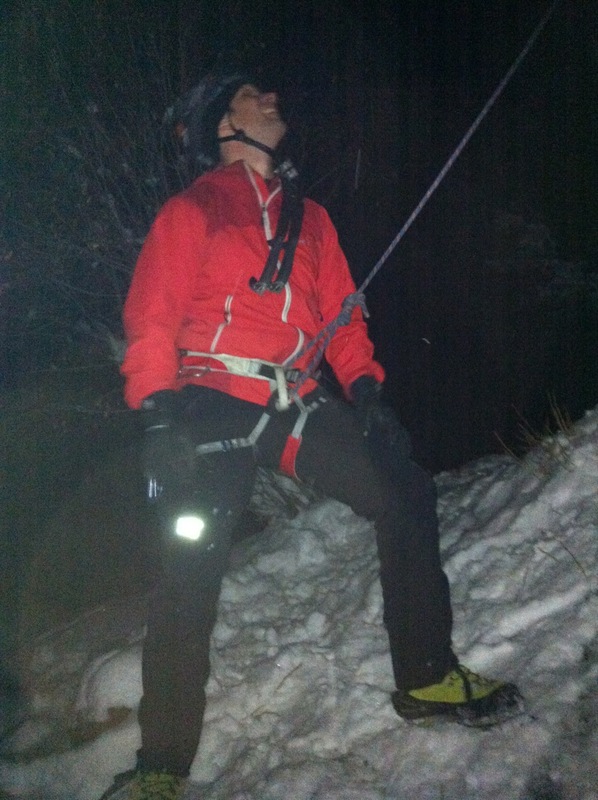 Many thanks to Michael Moore for the photos, and Molly for the stellar belay. I raced the sun out of the canyon, and made it home in time for some non-profit work, laundry, and a solid meal. Somehow, I was firing hot in the chilly temps. I can’t think of many places to combine sports like this. With the long weekend coming up, I’m sure there is more trouble on the way. These are the kinds of adventures I want to make sure I have more often this winter. 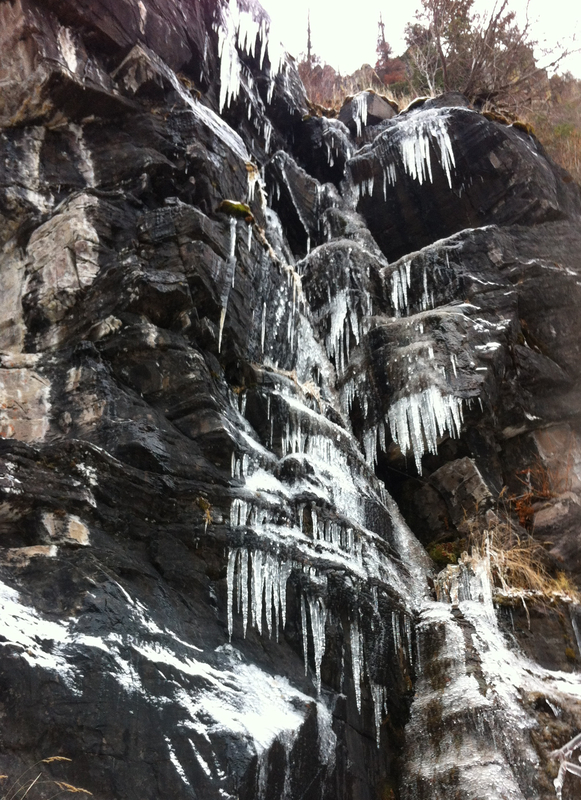 This entry was posted in Ice Climbing, Rock Climbing, Skiing, Traveling and tagged ice climbing hyalite, mill creek rock climbing, St Mary's peak on November 27, 2013 by sticker1. I’m behind on posting, but not for lack of adventure. A week ago I was in Jackson, WY- fighting a nasty cold, loving some time with my lovely lady, and catching up with one of my Denali partners via a foot of Freshiez off of WYO 22. Getting our fix at the Teton Ice Park. This weekend I’m in Bozeman for much of the same. Despite not ice climbing much this year, this afternoon I was able to tick a line that has inspired me since my second ever trip to Hyalite in 2009. The Sceptre gets WI5 in the guidebook, but at this point in the season it climbs like a stiff grade 4. I felt really fortunate to share the beautiful weather yesterday with two wonderful climbers (one of whom I had known only by reputation)- thanks to Marko and Echo for being such strong and inspiring partners. The Scepter is adjacent to The Mummy II, which makes for a nice warmup. The title though relates to one of the coolest parts of my Saturday. I’m warming up on top-rope in the foreground, but in the back you can see The Sceptre- with someone else climbing on it. I had noticed two older gentlemen and a younger guy approach the climb before I left the ground and I assumed the younger guy would lead it. 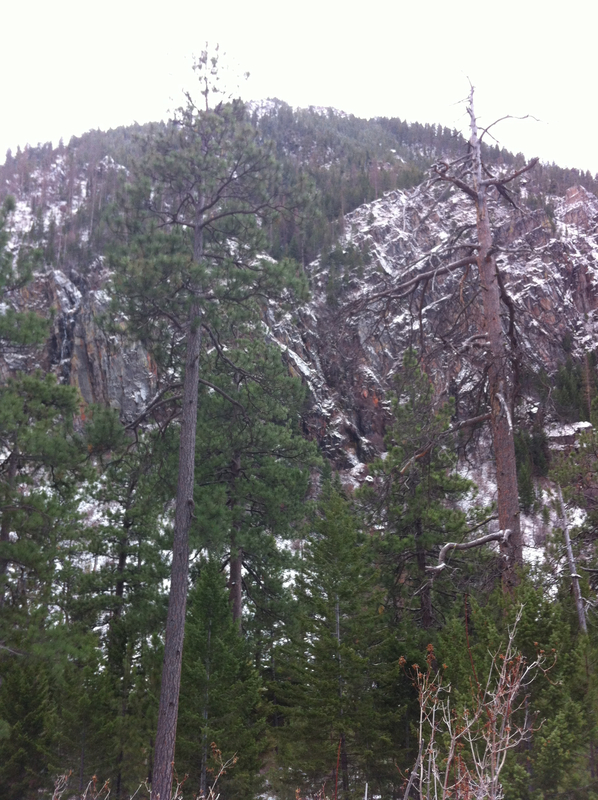 I should have known better- there is an old guard in Hyalite, guys who have lived and climbed here for over 40 years. They are responsible for most of the established climbs, most of the mentorship, and most of the special energy and spirit that this place has. I had only heard of Pat Callis from guidebook descriptions, but those guidebook descriptions credit him with first ascents as early as 1973. Pat was out climbing yesterday, I’m guessing he is in his mid-60s, and leading The Sceptre as confidently as most people his age discuss bond investments or board a flight to Paris. He was also mentoring the younger man in his party, as I’m sure Pat has done for countless other Montana climbers. I found the climbing challenging and wasn’t entirely sure I’d finish things cleanly. Climbing is a beautiful equalizer, and also equally accessible- if you want to do it, take care of your body, and are humble enough to learn- there are very few limits on what you can accomplish. 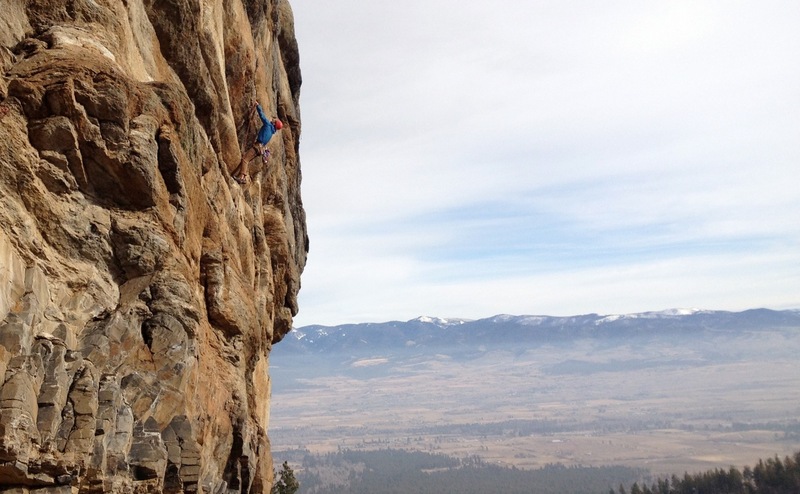 The climbing community in Montana is riddled with the old guard, and I’m privileged to be around them. 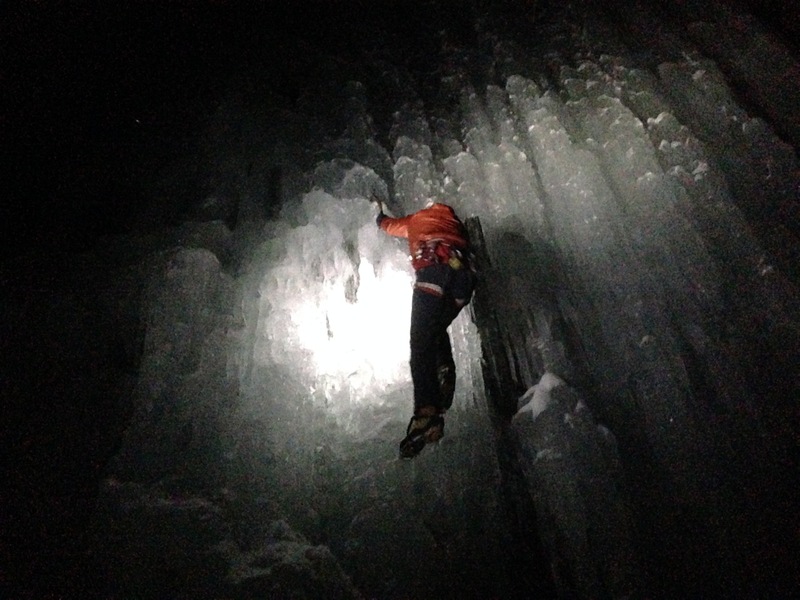 This entry was posted in Ice Climbing, Montana Experience, People and tagged Hyalite, Mt. Glory - WY, Pat Callis, Sceptre, Teton Ice Park, WYO22 on March 3, 2013 by sticker1. Cousins Peter and Brit show off the latest fashions (exterior door shown for scale). I rolled in on Saturday afternoon, and after a quick hike to check on ice climbing conditions, Sarah and I joined in the Santa pub-crawl mayhem. Well… someone needed to step up and be Pimp Santa. 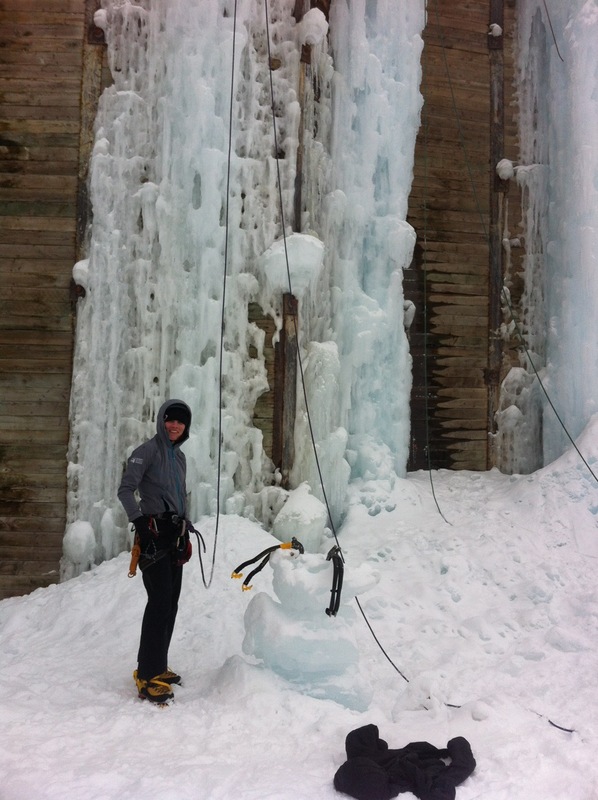 Despite a great outfit, I bailed on the pub crawl relatively early with thoughts of ice climbing on my mind. 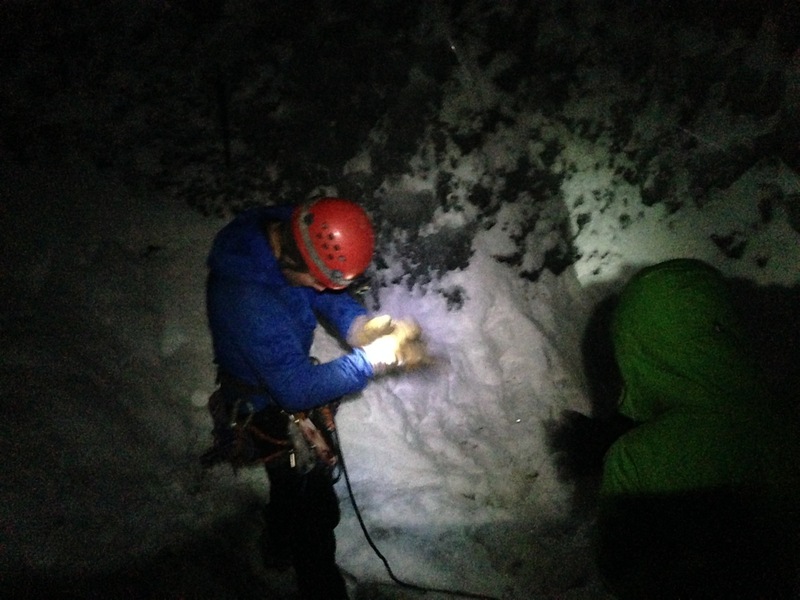 The ice was surprisingly poorly formed and thin, and while Sarah and I ticked 3 of 4 pitches on “The Great White Icicle” (WI 3, 4p), eventually my judgement won over, and we headed for Brit’s hot tub and a fun little jam session with a few other folks. 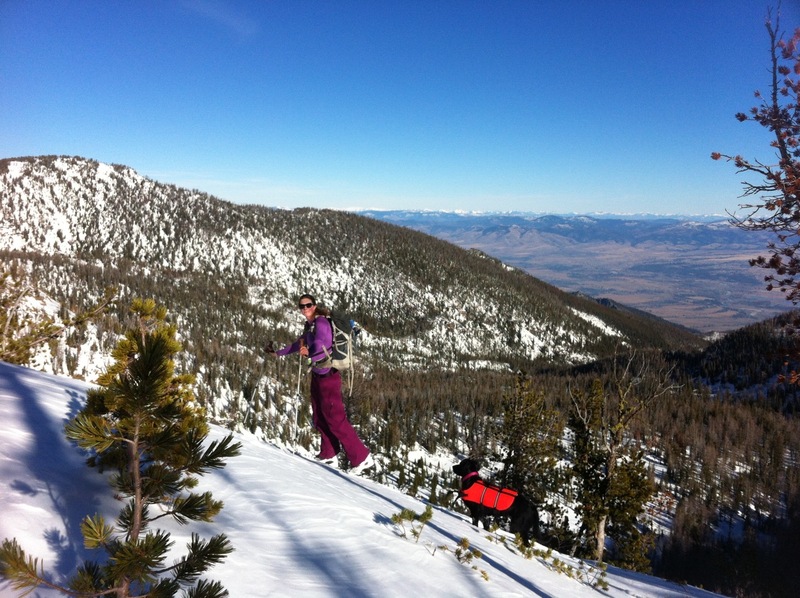 Sarah isn’t as into backcountry skiing as I am, but fortunately she’s got some great friends. Matt C, Hasen, Tyler, and Matt X, thanks so much for letting me join the fun. It was dumping powder in the Wasatch, and while that pushed us on lower angle slopes, we still had an amazing day of skiing. Sarah had lunch on the table when we rolled home, and suddenly my cello was in hand while Matt C sang Talking Heads. Doing due diligence in the avy pit. Christmas Eve finished cooking a stellar meal with Sarah, then a small gathering of friends hosted by one of her former professors. My drive home featured dry roads, and clear skies, so the hours passed quickly. 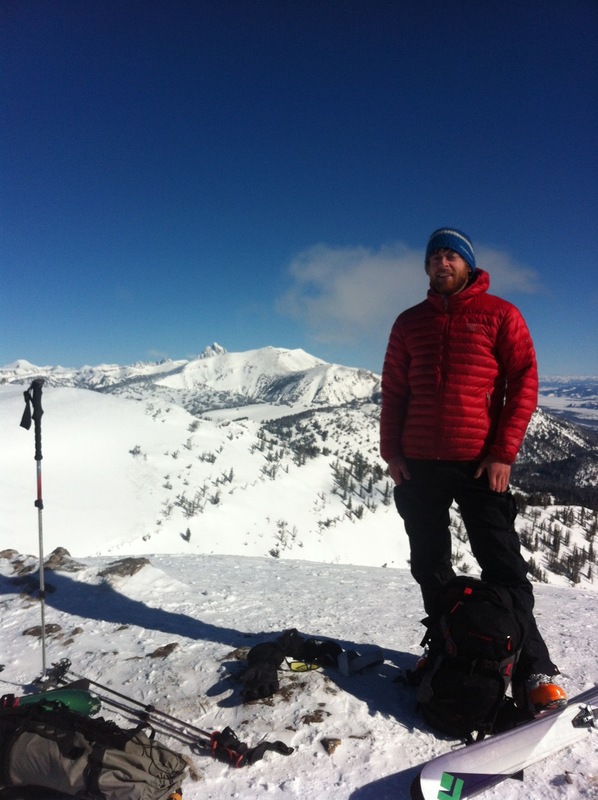 Even with all of the outdoor sports centered in Salt Lake, I’ve spent very little time there. With friends like these, I suspect I’ll be back soon. Somewhere south of Dillon, MT. 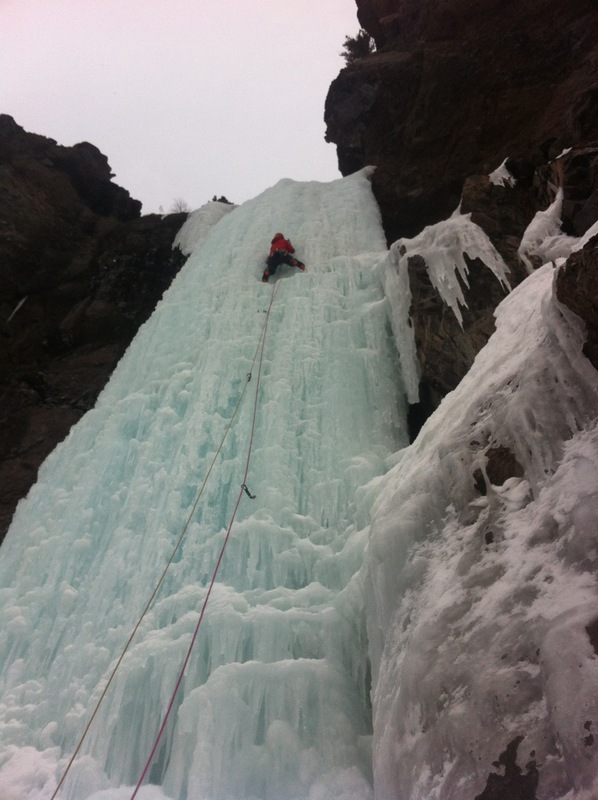 This entry was posted in Ice Climbing, Skiing, Traveling and tagged backcountry skiing, christmas weekend, friendship, Ice climbing, santa pub crawl, wasatch front on December 30, 2012 by sticker1. Full of stoke, Conor D. and I got after it Saturday morning, only to find 18 people in line for Champagne Sherbet and Champagne Slot (which are both forming nicely). So we hiked. A lot. Finally we gave up on finding some more elusive climbs and headed for the Genesis. Some top rope laps at G1 left us feeling like we had at least done something, and we followed the festival down the canyon as the light faded. This years festival included a Saturday night party built around an outdoor mixed competition at the Emerson center. Credit to Marko P., Craig P., and many others for construction and route setting. Complete with outdoor firepits, live music, and beer vendors, Saturday night was a very good time. 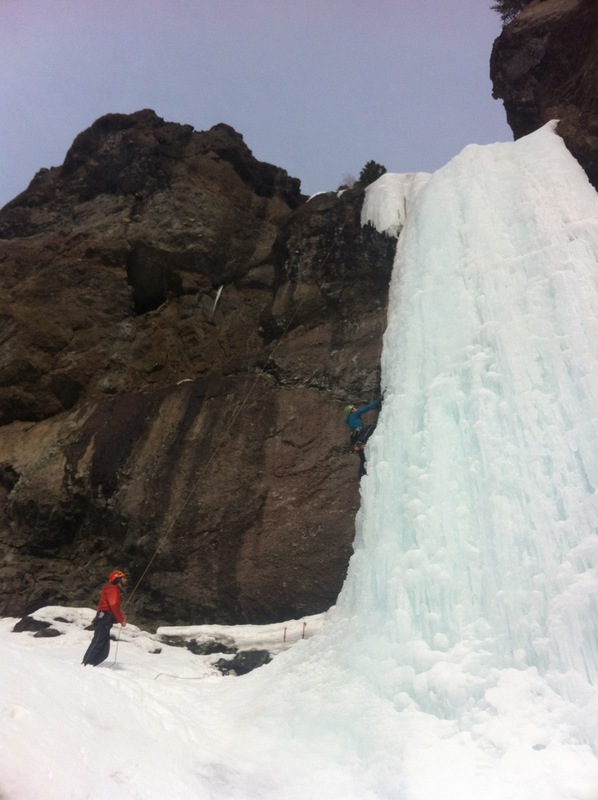 Stephanie Maureau- climbs harder than almost all the boys- crushing it. 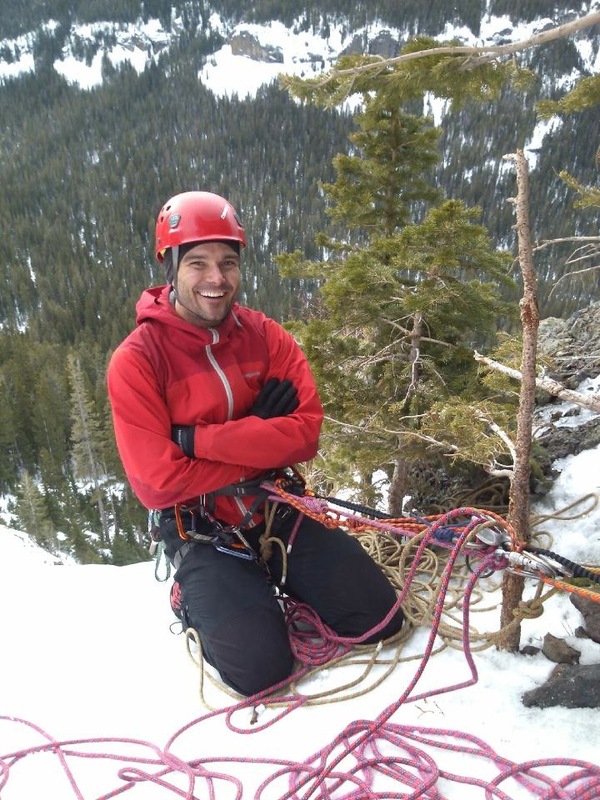 Bozeman hardman Whit Magro straddling a free handing log 50′ up and 20′ across the overhanging traverse. Sunday Conor and I linked up with a few other Missoula boys (Cole, Josh, Mack, and Cory) and took over the amplitheater. I’m still a terrible mixed climber, and was just as happy for Conor to put up the rope on the mixed line just left of “Thin Chance” (which was in, but a little thin for my shaky lead head). We did both lines, then a lap on Climbs on the Left- by no means a banner day, but I really don’t mind easing back into ice season. Lots for me to remember. Sunday night I felt fortunate to be invited to dinner with a few new friends who work for Grivel North America. It might have been more prudent to head for Missoula on Sunday night, but these connections are one of the reasons it’s so fun to come to a festival. We enjoyed perfect conversation over perfect food, and my week has felt a little richer because my circle of connections in this strange frozen circle is just a little larger. The additional time was well worth the speedy drive back on Monday morning. This place is always spectacular. 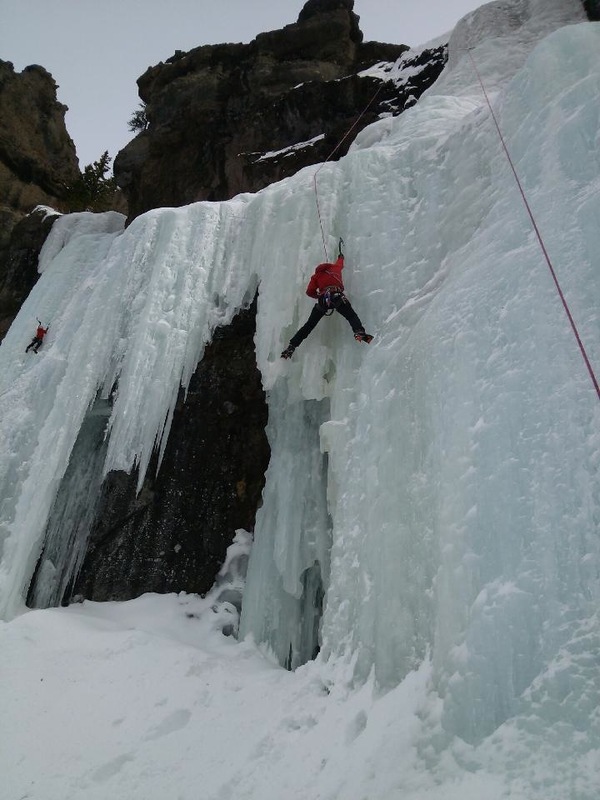 This entry was posted in Ice Climbing, Montana Experience, People and tagged Bozeman Ice Festival, Grivel, hyalite canyon, mixed climbing, Stephanie Maureau, Whit Magro on December 12, 2012 by sticker1. 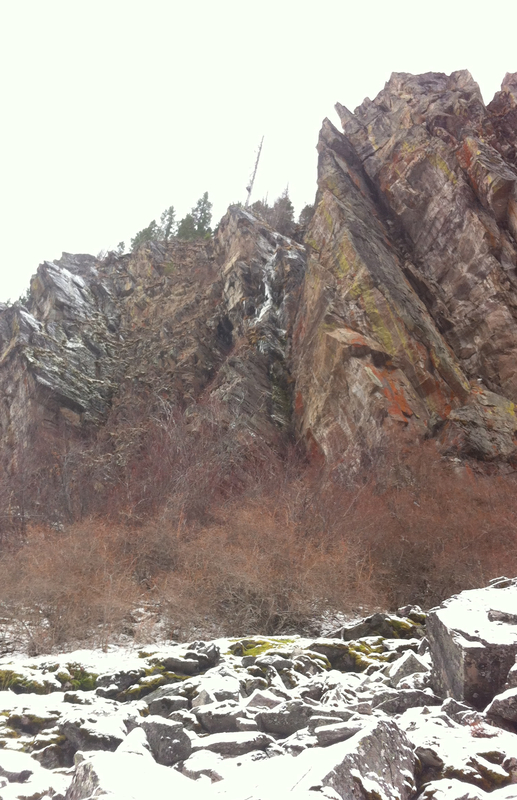 The black streak is where the GrainEater is supposed to be- taken yesterday December 2, 2012. This was taken from the same vantage point (approximately), on Nov. 27, 2011. 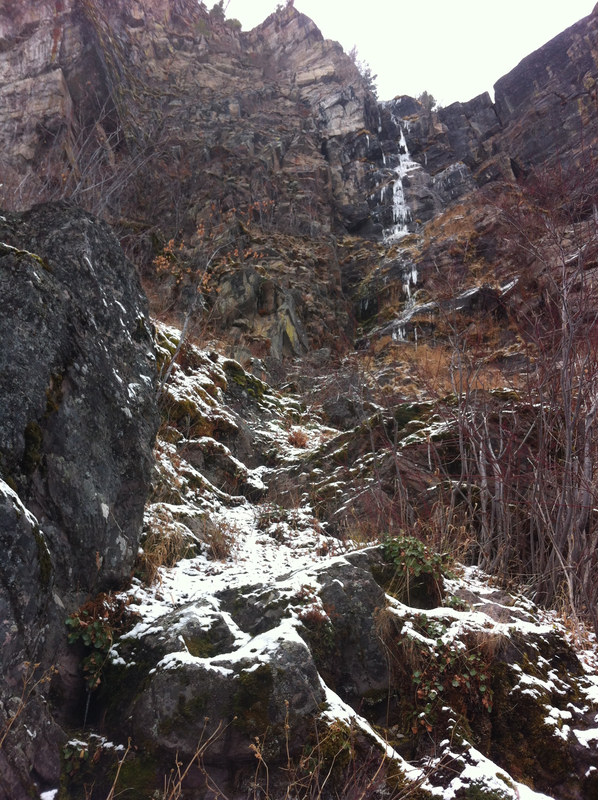 While this is thin compared to what the climb would be, it was fully climbable at this point in the season last year. 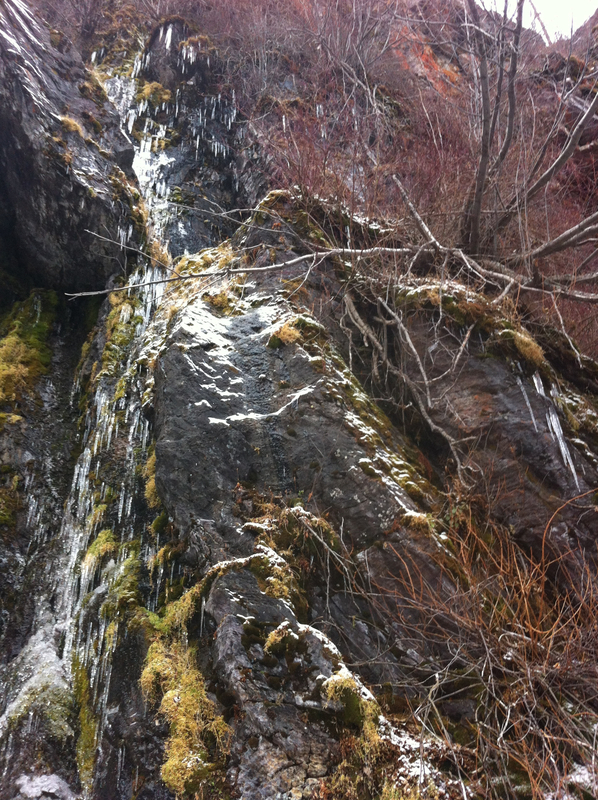 There was almost no trace of ice in Finley Creek on Sunday- a few wisps of ice hinted at the location of the climbs, but nothing that even resembled a “route”. It seems reasonable to say that we are 3-4 weeks behind last season in route growth. We spent most of our time hiking in a 40 degree rain storm. Ski conditions are marginal, and “unseasonably warm” almost seems like a misnomer because it’s hard to be sure what season we are actually in. It sure seems like the planet is telling us something. 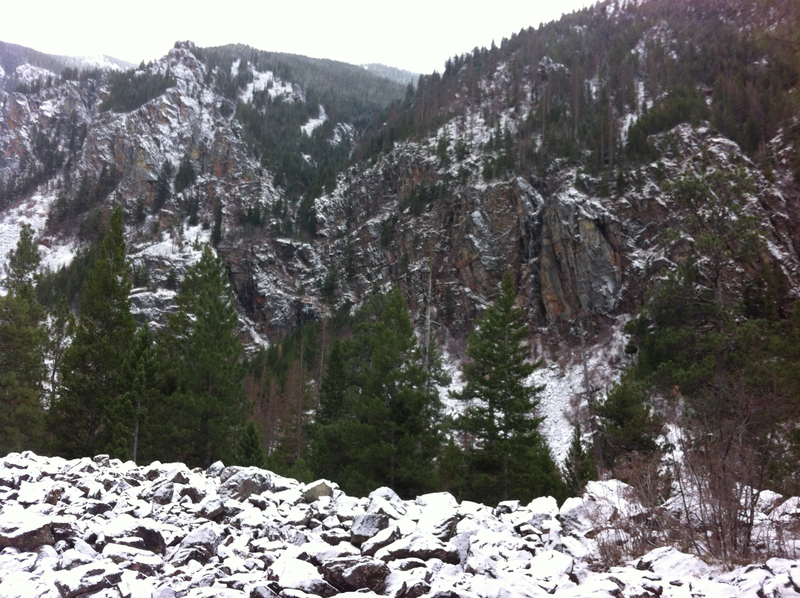 Several hundred vertical feet and a two miles up the canyon we finally found some semblence of winter, but only barely. I made it to the lake in trail running shoes. Whether or not there is ice in the hills around Missoula in December isn’t alone an indicator of climate change- I won’t pretent that for a minute, but with plenty of other evidence around, it seems plausible there might be some connection to my little backyard ice playground. The lack of societal concern about climate change is thoroughly frightening to me. 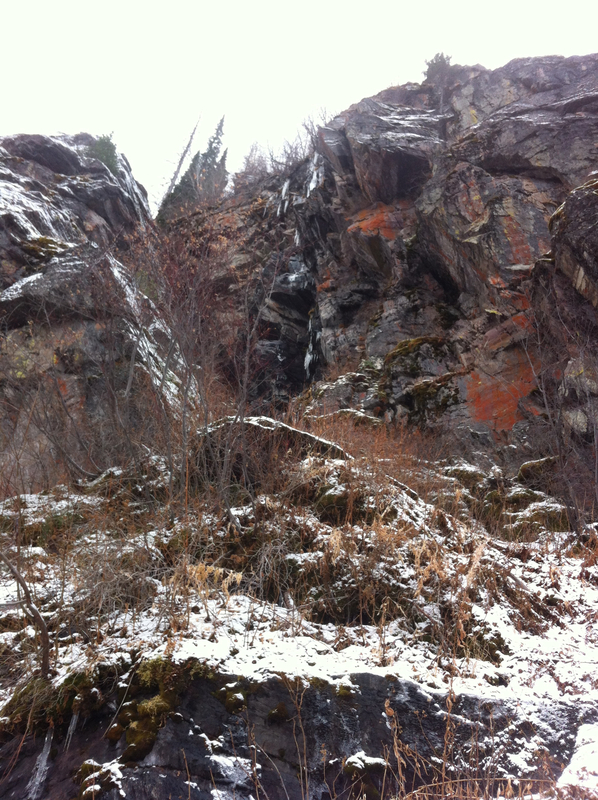 This entry was posted in Ice Climbing, Missoula, Political Action and tagged climate change, Finley Creek conditions, Ice climbing, ice climbing Missoula, junk science, political discourse, political rhetoric, Rachel Maddow on December 2, 2012 by sticker1.